Madeline Munrove’s mother instilled three truths in her daughter. These truths were as follows: First, men were basically useless creatures driven by decisions calculated below the waist. Second, women were far superior in intelligence and fortitude. And third, women must pretend the first and second were untrue if they hoped to navigate in a society ruled by such worthless creatures. Enter Douglas Fontaine, a man whose life is ruled by logic and analysis. Such behavior is the reason he has created a ‘test’ which prospective brides must pass in order to gain consideration for the position of ‘wife’. When a chance game of cards with a scoundrel wins him a country estate, Douglas has no idea Madeline resides at the estate or that his very ordered existence is about to be upended. 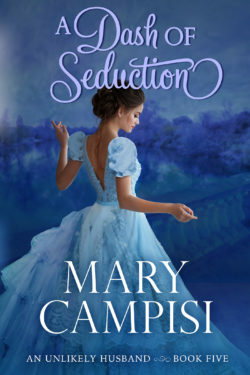 NOTE: A Dash of Seductionwas previously published as The Redemption of Madeline Munrove.